Good morning! Today I want to show you the gifts I brought with me to Onstage last weekend. My upline's team is called the Pinkies so when I saw this Pink Fizz bath bar, I knew I had to get it! The fact that it smelt lush was an added bonus. 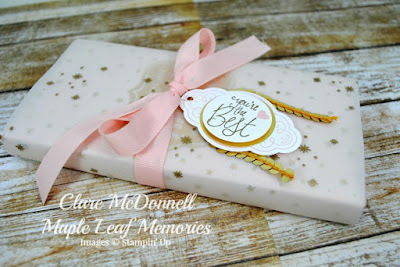 I took inspiration from the bar itself for my gift wrapping and stamped multiple stars onto vellum with Versamark and heat embossed with gold embossing powder. 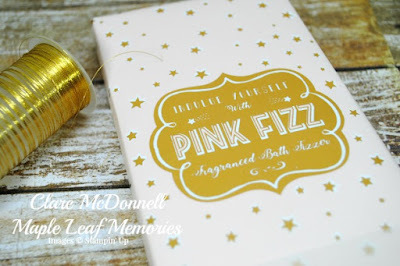 I stamped a tag using the Label Me Pretty set and cut it out with the co-ordinating punch. 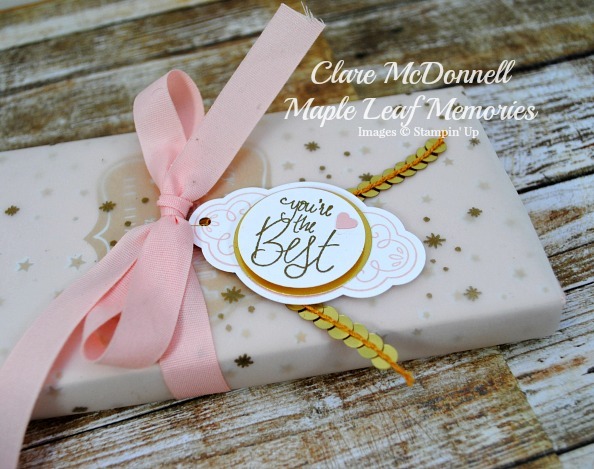 I embossed the sentiment in gold as well and added a small pink heart punched out using the Cookie Builder punch. I added some gold sequin trim to finish and tied it all up with some Powder Pink Ribbon. I also brought a gift for my roommate Nicole. We have been sharing a room together since I first started attending Stampin' Up events and we always have a great time! I was a bit worried about how it would survive the trip in my suitcase but luckily enough it arrived in one piece. 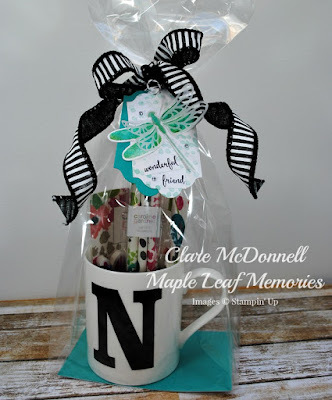 I purchased the initial mug earlier this year and filled it with some designer pencils and matching heart post-it notes perfect for Nicole to use with her new Spring/Summer catalogue, I'm just hoping she had enough as the new catalogue is amazing! I filled up any remaining gaps with chocolate. 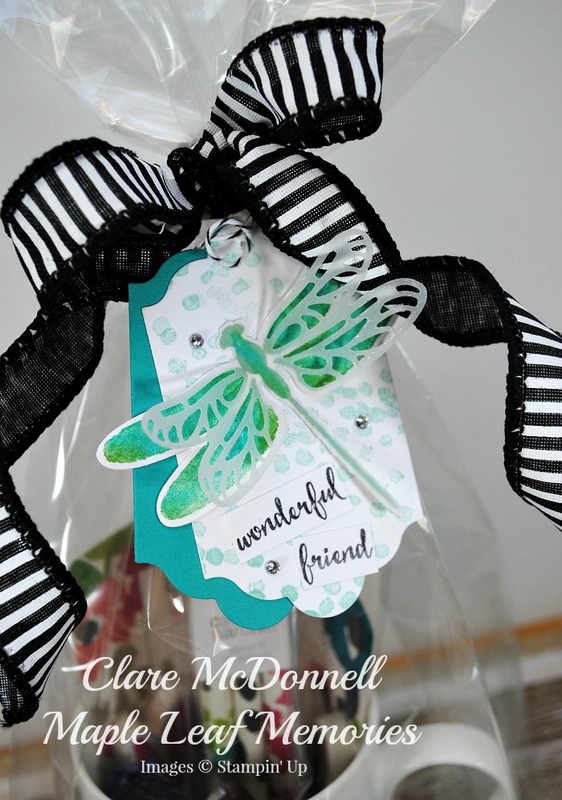 I placed some cardstock in the bottom of a Gusseted Cellophane bag to create a base, added the mug then tied the top with some Black and White wired ribbon from the Autumn/Winter catalogue which I curled around a pencil. I stamped the base of the dragonfly with Bermuda Bay ink and daubed some Old Olive onto the edges. I cut it out with matching dies and also cut a detailed dragonfly from vellum using the same dies and glued them together at the body. I cut two tags from the Lots of Labels framelits and stamped the Whisper White tag with the back round spot stamp and Pool Party ink and added the dragonfly and some Rhinestone Jewels to finish. I hope you enjoyed my shares today. If you would like to purchase and of the supplies I've used, just click on the link below to be taken to my Online shop. Don't forget to use the Hostess Code when ordering which is YDEAEZTX and receive a thank you gift from me.